Torbjörn Blom´s Projects: The concrete is poured. 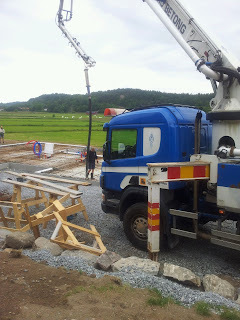 But build site have not been idle because of my family business. 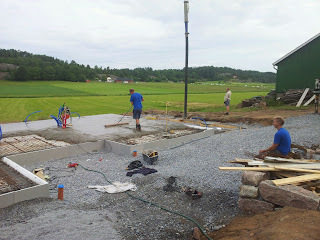 The concrete slab is poured and have been hardening for 3 weeks now. It looks promising but the house feels small. But I think it will change when the walls are there. Currently are the builders on summer vacation and will start working in the beginning of august again. The plan is to get the walls and roof on in a few weeks then will the windows arrive. During the summer vacation are we starting the the garden. The plan is to sow the grass lawn in end of august so we can get a head start on the weeds. But before we can do that do we need to break up the hard crust from the excavator. This is hard work because of all the rooks in the ground. But I do not need any gym card after this and it is also nice when you get a helping hand. There will be more updates when they will start build again, so until then have a nice summer and let the sun always shine on your side. Last picture of the they, what do you do when there is no shade for your caravan. Build your own camping site!